The Bangladeshi capital was visited three times in our three week study tour to Bangladesh. At the start, between Bhola Island and Rajshahi, and then finally at the end too. It is one of the maddest cities on Earth, and really has to be experienced to be believed. As I mentioned I stayed at the Kushiara Guesthouse. It was on a very busy street, constantly filled with heavy traffic and pollution. 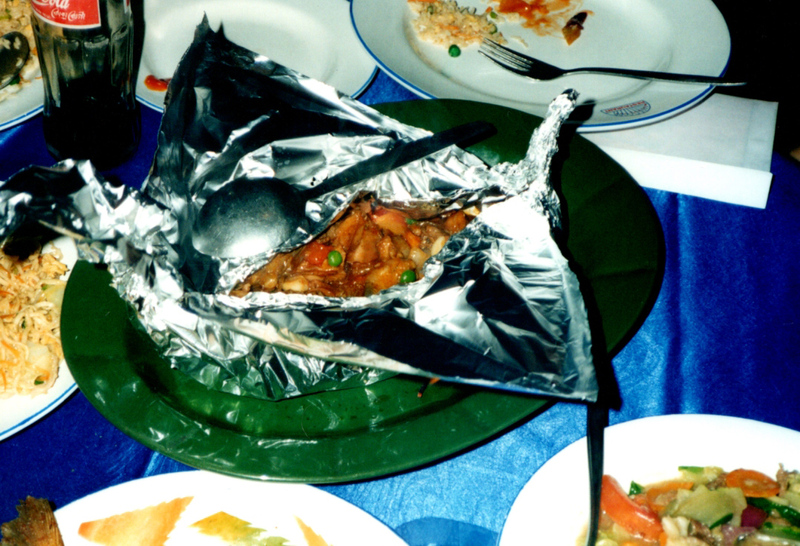 In some way, for our group, this alone WAS Dhaka. The staff, and there were plenty, fussed over us and became good friends too. There were other guests naturally, however sometimes it felt like that guesthouse was OURS. It had a nice little restaurant where we ate and had briefings. 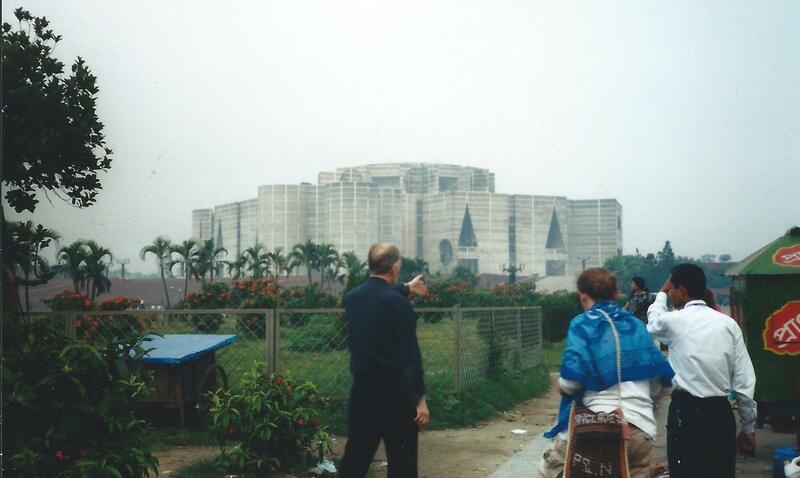 The first stretch in Dhaka wasn’t long, but we visited a few places. 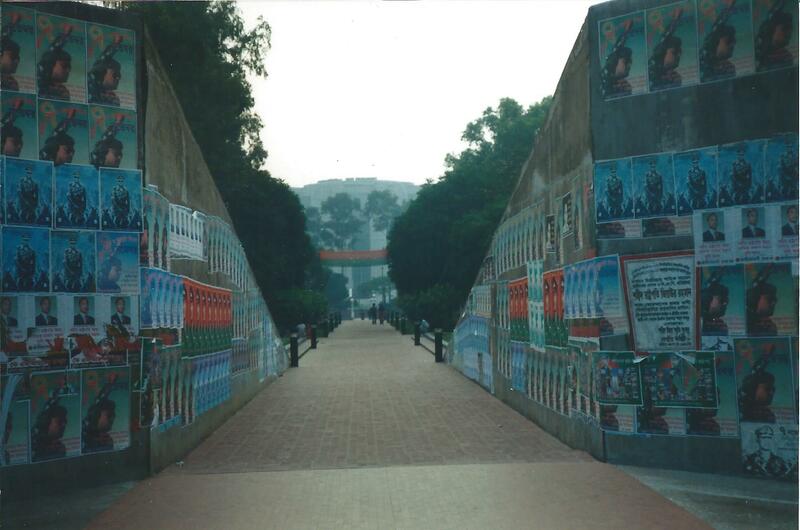 The Liberation War Museum was one such place, where we learnt about the days where Bangladesh was administered from Pakistan, when it was actually known as ‘East Pakistan’ despite there being a country between the two. This was the way colonial Britain split the sub-continent when they left in the late 1940s. Bangladesh only achieved its independence after a bloody war. There were parks and statues of those who brought about independence we saw. And we saw the grey concrete Parliament House where the country is governed from. It’s strange when such a congested city as Dhaka opens out into more open spaces. Then we visited schools, but I have little memory of those, and the Australian Embassy where we heard about AusAid, the Australian government aid organisation. And there lay for me the biggest questions about the real (if any) value of aid. Because the projects were designed and planned primarily by Australians, and therefore chosen too. That’s the reality of aid – a concept still somehow rooted in missionary work of centuries past where people were helped if they converted to whatever strain of Christianity the groups that came across the seas had. Owning and changing identity, not having any self-determination. And yes I know that it can be argued that those who offer the money may have some sort of right to determine where, when and how it used. But is this the way the world can achieve some sort of equality, or does it, by design, maintain the status quo? 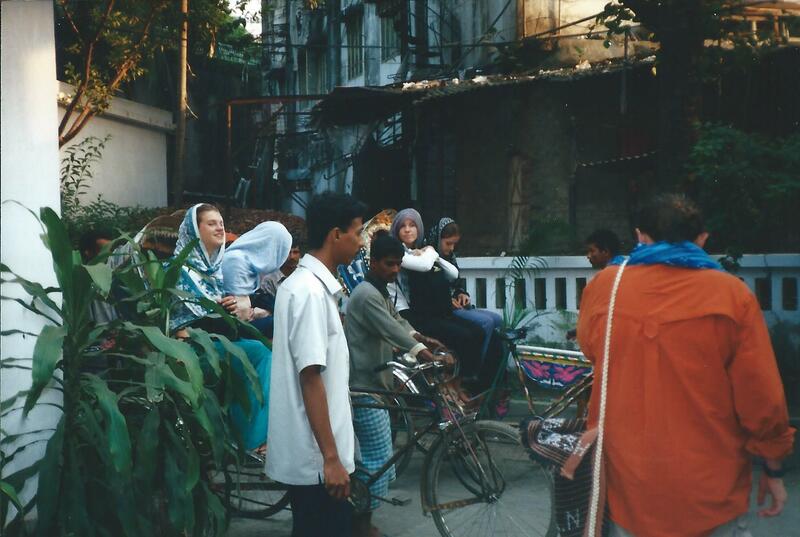 Rickshaws outside Kushiara – where I took one at night to hospital. Anyways. 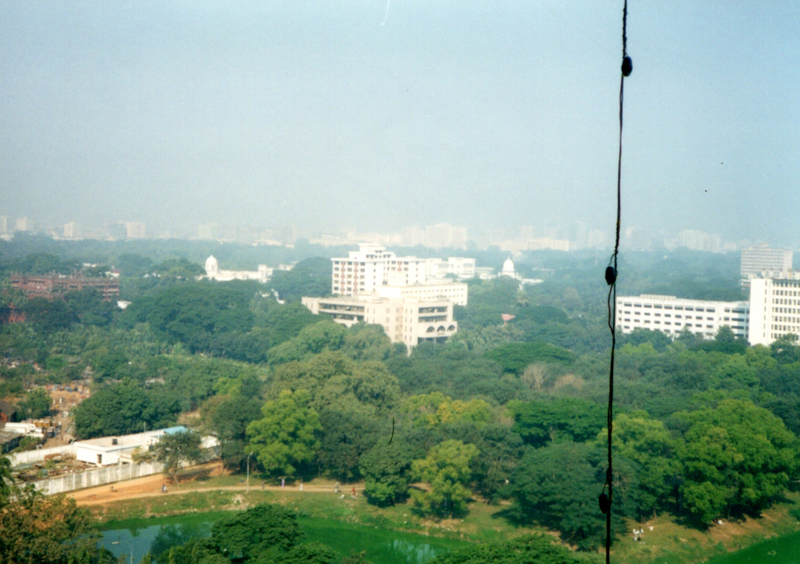 The second coming of Dhaka I have written about before. The night after we’d got back from Bhola Island I went out with a couple of others to try a small restaurant across the road from our guesthouse. I had a curry. It seemed spicy. It also had peanuts in. Rushed back to the guesthouse for anti-histamine. One of the girls needed to administer my epi-pen (only time thus far in my life) and then I was taken to a doctor’s – literally around the corner – and then to hospital. It was all a bit of a blur as you can imagine. I survived. 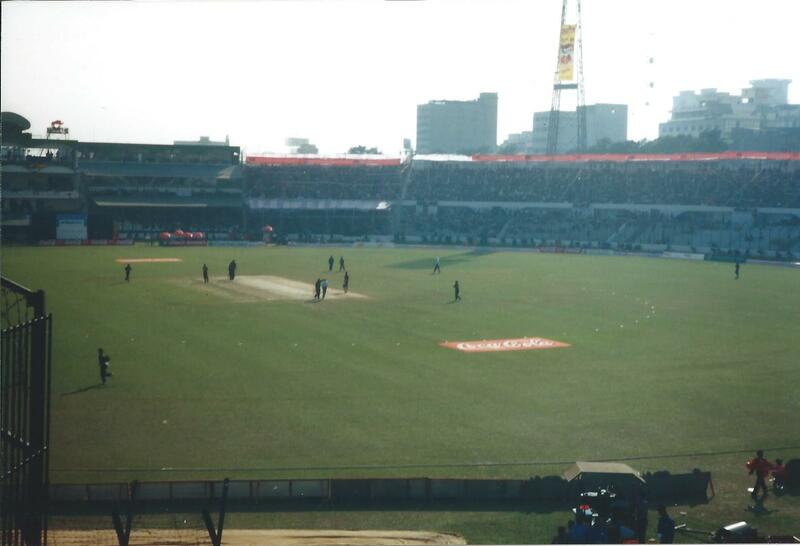 A group of us went to the cricket in Dhaka, Bangladesh taking on the West Indies. They competed well Bangladesh, but lost. 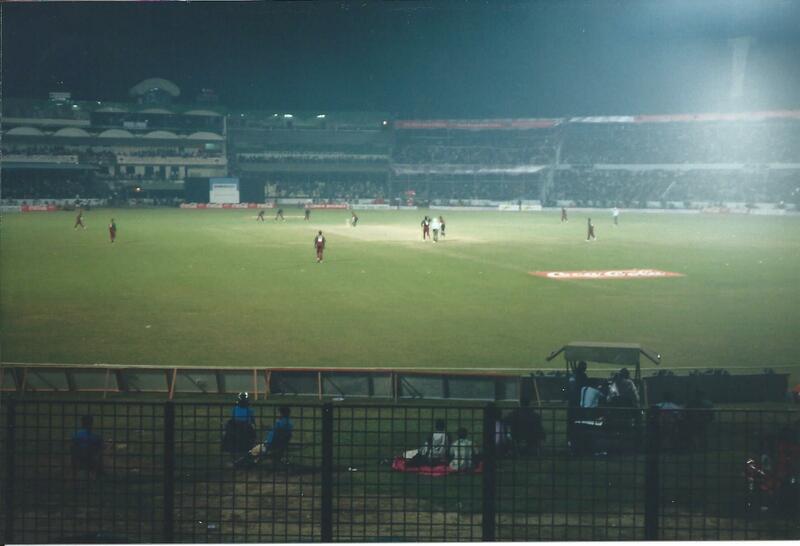 It was an awful lot of fun and the crowd were so happy to see international cricket being played in Bangladesh. They’d only recently before that achieved Test Status which meant that they would be able to play a lot more international cricket in various formats, and more to the point against the best 8-10 teams in the world. Only a few days ago they played their 100th international test match, which they won. They country is nearly as cricket mad as India, and the team is a major source of pride. If there is a one day or Twenty-20 game on if you’re visiting it’s definitely something you should go to! 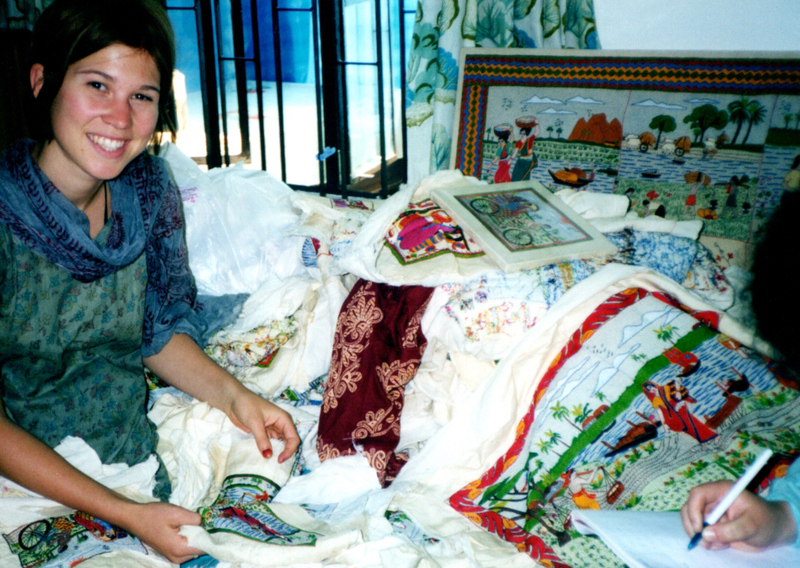 After Rajshahi we came back and spent time doing shopping and I think we had the chance to go out on our own or in groups to look around a little. I had bought some material earlier and when I had my allergy episode I had spent the next day in the guesthouse recovering, and the others had taken it to a tailor who made this rather wonderful shirt out of it. The final night we had a big dinner out, at a Chinese Restaurant of all places. I know that Chinese cooking often has peanuts in but I had no issues. 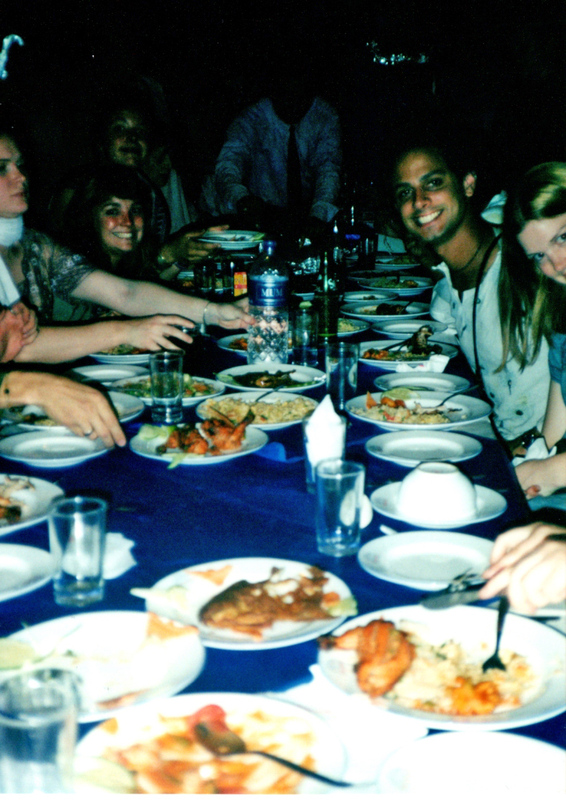 We had had a couple of families around us whilst in Dhaka so they were there, and it was a great last night. The end to an amazing three weeks. 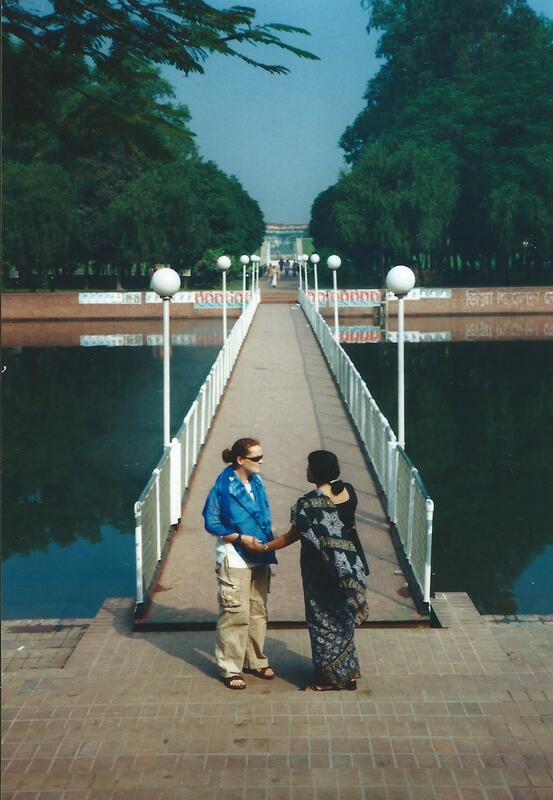 I would be back in 2004 to start my land journey to Europe from Dhaka. 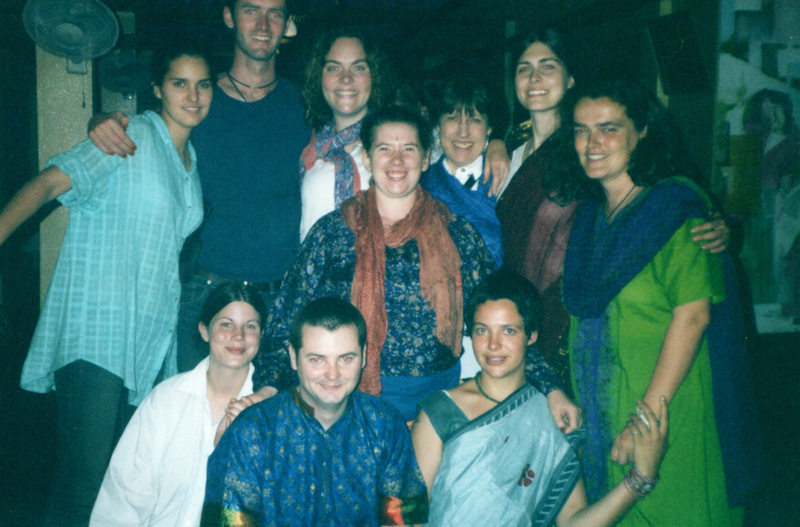 I would stay in Kushiara Guesthouse again and I saw all the friends I’d made during the 2002 trip. I spoke to the manager there who seemed thrilled I’d chosen to start my journey from Dhaka. He talked to me about an idea he had had – ‘reality tourism’, people coming to poorer countries to see how others really live. And there is that ‘voyeurism’ question again. Make no mistake, some tourism is pure voyeurism. Is that a good thing? The guy says no. The mind says ‘well, it depends’. Travel, like International Aid, can and should raise many questions about how the world functions. The rights of individuals, communities, the value of a dollar. Nothing sits ‘just right’ with me. And so it shouldn’t. But if travel isn’t questioning who you are, how you relate to the people of the places you visit, the way the world order puts you where you are and allows you to explore, then maybe you’re totally taking your ability to travel for granted. Please don’t. 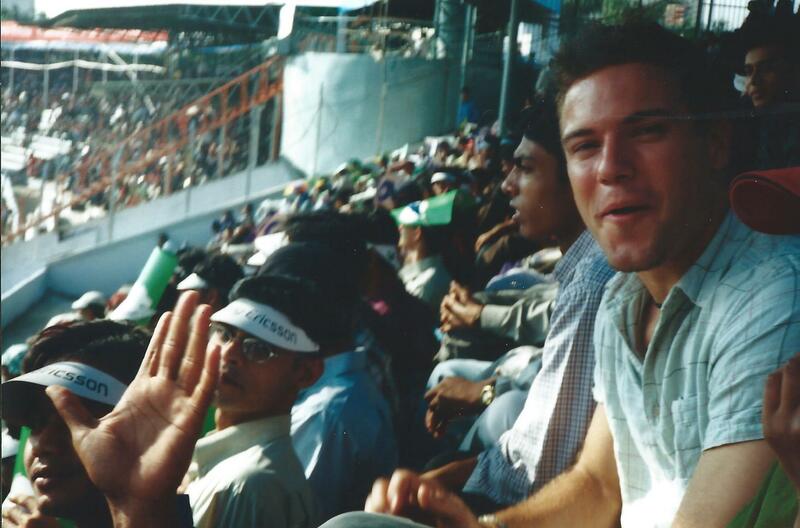 A trip to Bangladesh is probably easier today than it was 15 years ago. Okay it definitely is. The question of if you should go is up to you. Ask yourself ‘why?’ first. 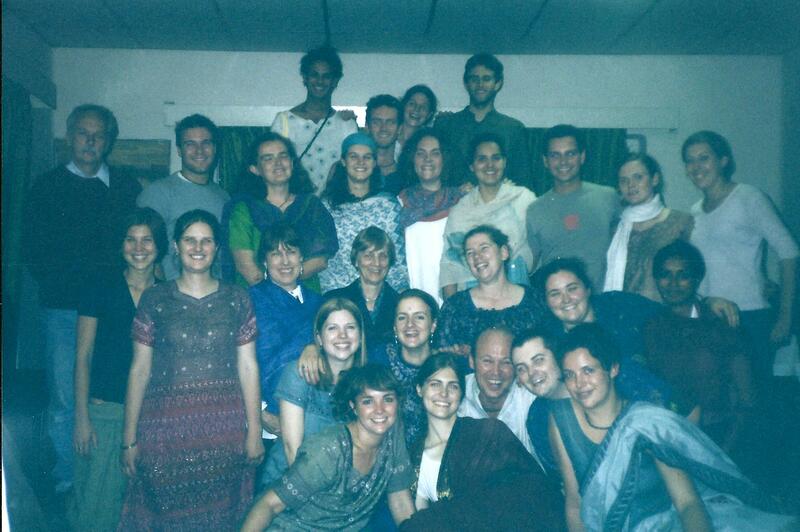 I returned in 2004 on my own not to start a long journey but to be able to go back and see the people I had met. In reflection, I wish I had again. Thanks for reading. May the Journey Never End. Looks and sounds like a great journey! I’m glad you survived that peanut attack! And those Dhaka streets – you really have to experience them for yourself, right?